Retrieve the Amulet of Kings from its hiding place. Sai Sahan has recovered from his experiences in the the [sic] Halls of Torment and is ready to guide me to the Amulet of Kings. He hid the artifact in Sancre Tor, an ancient Imperial catacomb. Talk to Varen Aquilarios in the Harborage. Listen to Mannimarco in the Sancre Tor Inner Chamber. Consecrate the shrines in the Dragonguard Tomb and the Reman Vault. Listen to Mannimarco in the Vault Antechamber. Continue to the Vault of Kings. Open the Vault of Kings. Take the Amulet of Kings. The Prophet appears when you are close to a major city. Talk to Varen Aquilarios in the Harborage. He says Sai Sahan hid the Amulet of Kings in the catacombs of Sancre Tor in the Colovian mountains. He refers you to Sai Sahan. Sai Sahan says the Amulet is in a vault protected by a ward of Stendarr, the God of Justice, Mercy and Well-Earned Luck. Enter the portal to Sancre Tor, and follow the path to a large room where Mannimarco appears. He knows you are looking for the amulet. Talk to Sai Sahan. If you hurry, you might be able to retrieve the amulet before Mannimarco. Follow the south passage, and enter the Sancre Tor Interior, then the Inner Chamber. [Optional] Once in the Sancre Tor Interior, there is the option to enter the Crypt of Heroes. Doing so will cause Mannimarco to repond with a quip about entering a crypt with a necromancer about and spawn a small army of undead foes. After disposing of them, there is a crypt in the center of the area you can enter that holds a moderate amount of loot in various containers. Exiting the crypt will trigger Mannimarco summoning the Lord of Iron and Woe. 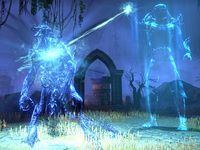 In the grassy area in the inner chamber, Mannimarco appears again and reveals his plan to steal the Amulet without Molag Bal's knowledge. 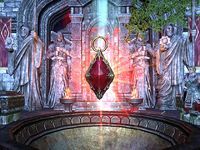 The ward of Stendarr will hide him from the God of Schemes' view, then he will use the Amulet's power as the greatest soul gem ever to trap Molag Bal's soul. He summons three Worm Cult necromancers and a bone colossus. You defeat them and head east to the Inner Courtyard. Sai Sahan is exhausted and needs to rest. Talk to him or Lyris Titanborn. You need to consecrate the shrines with Stendarr's blessing in the Dragonguard Tomb. The door to the Dragonguard Tomb is to the west. Inside, Mannimarco announces to your group that he raised Sai Sahan's fallen comrades. Sai Sahan does not want to kill his former friends, so he relies on you for most of the attack. Make your way to the Shrine of the Divines, a brazier in the west end of the tomb. Once it is lit, head back east to the Inner Tomb. Follow the eastern passage to the Reman Vault. (Before pulling the levers, there is one of the unlocked chests to the right - follow the river and keep looking right.) To consecrate this altar you need to lower the drawbridge first. Pull the 2nd from the left, then 3rd from the left, then the leftmost lever. Once you light the brazier, Mannimarco's followers appear and attack you. You need to continue on into the Vault Antechamber. Go back into the Inner Tomb and follow the final passage to the Inner Courtyard, then the Vault Antechamber. In the Antechamber, Mannimarco appears again. He shows a vision of all of Tamriel bowing to him. Defeat the enemies, then head to the Vault of Kings. The Amulet of Kings at last! Talk to Sai Sahan. You need to use the Ring of Stendarr's Mercy on the door. Inside, kill Mannimarco. 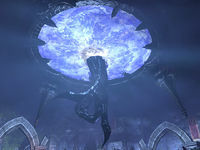 A Dark Anchor opens, and Molag Bal's hand scoops Mannimarco up and takes him to Coldharbour. To the west is the Amulet of Kings. Take it, and return to the Harborage. Talk to Varen for your reward. "We can sleep a little easier knowing that the King of Worms has been defeated, but we cannot rest too long. Molag Bal is still a great threat, and the Planemeld must be stopped." Before you reach the Inner Chamber, you will pass a door on your left. Sai Sahan will identify it as the Crypt of Heroes, which he may have warned you to avoid back in the Harborage. You may enter if you wish, but it is entirely optional. If you do, you'll have to fight several mobs of undead warriors. Make sure to examine the large tomb in the center of this area. There is a door on the far side. You'll find a chest with some treasure, and there will be a small boss fight when you loot it, the Lord of Iron and Woe. There are several unlocked chests in Sancre Tor which contain better-than-average loot (including the one above), but unlike most such containers, they will disappear after you open them once, even if you don't take any of the contents. You should be sure to have enough space in your backpack to avoid missing out. Prior to the One Tamriel update, this quest could not be started until level 40. A projection of Varen appeared to me when I arrived in town. I should listen to him and hear what he wants. Varen has beckoned me to the Harborage. I should go there and speak to him. I should talk to Sai Sahan, who can inform me more about our quest to retrieve the Amulet of Kings. I should wait for Varen to open a portal to Sancre Tor. We are ready to venture to Sancre Tor. I should enter Varen's portal and join Lyris and Sai on our quest to retrieve the Amulet of Kings. have ventured to Sancre Tor with Sai Sahan, Lyris Titanborn, and Abnur Tharn. We must explore the crypts and halls in order to find the Amulet of Kings. A vision of Mannimarco has appeared to thwart and taunt us. I should speak with Sai Sahan to see what we should do next. We must continue through Sancre Tor in order to reach the Inner Chamber. Mannimarco appeared once again in the Inner Chamber. Mannimarco has summoned the dead to thwart us. We must defeat them to continue. We have overcome the undead that were raised to thwart us. We should continue to the Inner Courtyard. Sai has asked for me to wait for him so he can catch his breath. Sai appears to need a moment before we move on. I should speak with him in order to ensure he is well. We must go to the Dragonguard Tomb in order to pray at the shrine. The shrine is on the other side of the room. We must make our way through these tombs to get there. We have prayed at the first shrine. Now we must make our way to the Reman Vault and perform a similar task there. We must pray at the second shrine before we can open the vault doors, but a chasm with an open drawbridge blocks our path. If we can find a way across the chasm, we can pray at the shrine. We've prayed at both shrines. Now we must return to the Vault Antechamber. Mannimarco appeared again. We should confront him and be prepared for his vile tricks. Mannimarco has raised the dead once more. We must defeat them to continue. We have defeated the undead in the Vault Antechamber. Now we must enter the Vault of Kings to retrieve the amulet. We've arrived at the vault. I should speak with Sai to see what's next. We are in the Vault of Kings. I must use the Ring of Stendarr to open the vault door. Mannimarco attacked us in the Vault of Kings. We should defeat him once and for all. We have defeated Mannimarco and sent him screaming into Oblivion. I should retrieve the Amulet of Kings as soon as possible. I have the Amulet of Kings. I should return to the Harborage and report to Varen. I successfully collected the Amulet of Kings. I should report to Varen Aquilarios. This page was last modified on 7 April 2019, at 22:11.